2 croms. 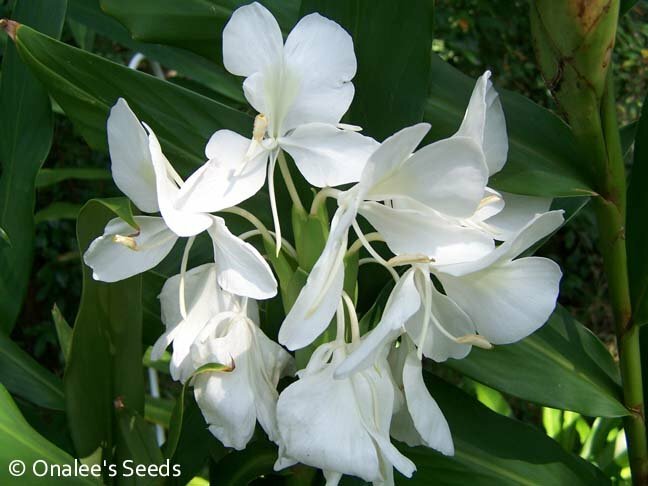 The white butterfly ginger (Hedychium coronarium) have pure white blooms that appear on the top of 5'-6' tall plants in late summer. These have the MOST HEAVENLY fragrance you can imagine! Excellent for a night garden or near a patio or deck so you can enjoy them in the cool summer evenings. You are buying 2 croms/rhizomes from my White Butterfly Ginger (Hedychium coronarium). Each rhizome will be 3"-5" long with at least one eye. The white butterfly ginger have pure white blooms that appear on the top of 5'-6" tall, thick green stems in mid to late summer. These have the MOST HEAVENLY fragrance you can imagine - one of my very favorite gingers! Excellent for a night garden or near a patio or deck so you can enjoy them in the cool summer evenings. These are hardy to zone 8a (although I have seen some reports of hardiness into zone 7, I cannot confirm that for certain). These can be container grown in colder zones. They like full to mostly shade and are happy in about any soil - the further south you live, the more shade they will require. Some sites say to keep them consistently moist, but mine are in a fairly dry area and doing fine if you have them in more sun, they will require more moisture to thrive. Overall, I've found the butterfly ginger to be a carefree plant that multiplies quickly and it's fragrant blooms (think Jasmine or Gardenia) make it a 'must have" in any ginger collection or night garden.